This is an initial comparison and by no means a comprehensive test of both cameras. I was looking for a camera that was user-configurable so I could lock down automatic white balance and tailor contrast and saturation. The GoPro Hero is tough and rugged, but doesn't allow for customization of its characteristics. It also had to have decent audio to allow sync using PluralEyes. Plus the audio would be a backup in case other audio went bad. The camera had to be lightweight, too. It's other role is on a small helicopter that can't lift much. In fact, the helicopter was never intended to carry a payload at all. But it was what I had, and it flew in an earlier test with a GoPro, although not all that easily. So after a false start -- more on that later -- I got the Replay 1080XD. My first impression was that it's a solid camera. Looks and feels like a simple, tough aluminum cylinder. The second thing I noticed was an o-ring seal at the rear cap. Similar seals are at the front end on the bezel and Lexan lens port. The only potential for moisture intrusion are the two buttons and a tiny hole for the built-in microphone. I haven't heard back from Replay as to how much of a dunking their camera can tolerate, and I've asked twice this week. I'd do a test myself but I don't have a budget for that. I won't go too much into detail about the the mounts provided except that they certainly seem sturdy. The rails are thick and fit snugly. Once it "clicks" in place, it's not going anywhere. 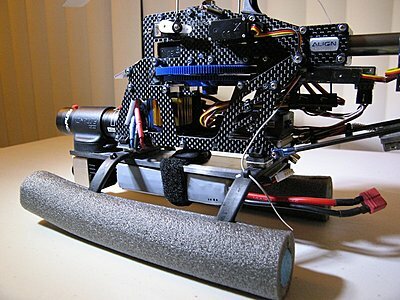 One of the mounts will put the camera into a fixed position. The other allows for limited tilting and 360-degree swiveling. A red aluminum lever locks it in position. There are several other mounts available as accessories. The camera is small, and the labels on the controls are proportionately tiny. If you suffer from presbyopia like me, then have your reading glasses handy. Performance: None of the cameras in this class will provide a truly stunning HD image, not compared to what you'll get with a handheld camcorder or better. However, to shrink a camera to this size means using a very small imager, and that means ultra-tiny pixels. And when it comes to getting a good image from a tiny package, the Replay 1080XD certainly delivers one that's as good or better than others. Here are simultaneous test shots taken with the GoPro Hero, undoubtedly one of the most popular POV cameras. First off, the audio from the Replay is good for such a tiny camera. The GoPro, because of the bullet-proof housing, can't catch much sound other than the occasional scream or engine noise. There is an obvious difference in the "look" of the uncorrected clips from the two cameras. The GoPro exhibits high contrast and saturation. It's to the point of being harsh. The Replay 1080XL is just the opposite, being a lot softer and with much less color saturation. My concern is that the "peak white" was way down, about 65 IRE. It should be closer to 90 or 95. Having a higher peak white recorded would make better use of the available dynamic range in the digital format. As a professional cameraman, I prefer lower contrast for source footage. Although the Replay's source footage might not "pop", compared to the GoPro, there's a lot that can be done in post-production to bring it up to where you want it to be. What I don't want is the highlights and colors to get "blown out" or over-exposed. The other obvious difference is in the way the two cameras handle lighting changes. The GoPro adjusts quickly and obviously. Sometimes when shadow areas are dominant, it over corrects. The Replay's corrections are a lot smoother and much less distracting. Many of these parameters can be set by a user, but it requires connecting the camera to a laptop or other computer. Generally speaking, the camera would be set for average conditions, then the footage is corrected in post. Replay warns the user to make any changes in small increments, then test the camera before putting it into service. That avoids any unpredictable and undesirable results. I shot these test clips on a bright sunny day. Didn't have a model to provide skin tone reference. So there's only sunny skies, a paved road and some foliage. Both cameras ran simultaneously and aligned so that they pointed more or less in identical angles. You'll immediately see the difference in field-of-view. The samples are both "raw" with no color correction, followed by the same shots with some basic color correction. I used Apple's "Color" software to make the adjustments. Several years ago this program was a $25,000 stand-alone package. Apple has since incorporated it into their editing suite for free. It's a very sophisticated setup that provides considerable control over all aspects of color. I couldn't get an exact correction that would cover the duration of either video clip. So I settled for a rough average for each. Both cameras feature automatic white balance, which means the color balance is constantly shifting, depending on the overall color of the scene. Color might be correct in one part of the clip, but way off in another part. It was possible to reduce the contrast and saturation of the GoPro, as well as to do the opposite for the Replay. In terms of general performance, both cameras seemed to do just fine. There is one other camera I looked at, the ContourROAM. 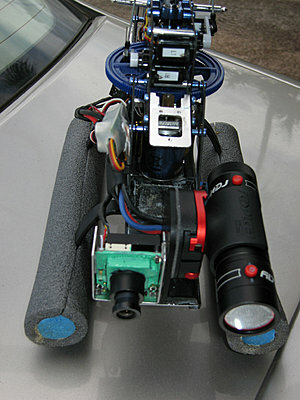 The company has high praise for its line of POV cameras. One of the features that caught my attention was the ability to configured the camera's characteristics, just like the Replay 1080XD. So I bought one. When it arrived, I found out that the ContourROAM is the only camera in Contour's lineup that can't be configured. Audio wasn't as bad as the GoPro but it was still way too low to be considered usable and unacceptable. The access door in the back of the ContourROAM was a simple slide-and-flip to open. I wouldn't expect it to provide any real protection as suggested by Contour's claims. Also, the higher models, the ContourGPS and the Contour+, are less water resistant than the ROAM, according to Contour's own information. The mount isn't as sturdy as the GoPro or the Replay. And there were reports of the Contour mounts breaking after normal use. When I reviewed sample footage online, I noticed that if a bright light source was just off-axis, there would be a black vertical streak in the footage from the Contour. Neither the GoPro or Replay exhibited this problem. So as a rugged sports camera, the Contour lineup didn't give me much confidence. And the Replay is about $200 less than the Contour+. Both share similar capabilities except that the field-of-view for the Contour+ is wider than the Replay 1080XD. I immediately returned the ContourROAM and ordered the Replay. So what to choose? GoPro or Replay? To be honest, each one fills a specific purpose. If it's not going to get dunked, I'd use the Replay. If it needed to be absolutely waterproof, the GoPro. Audio? Replay. Additional battery power for extended coverage? GoPro. To be honest, I have both. I just got a Replay HD to go with the 3 GoPros I have. Lots better low light and easier to hide. Dean, how are you making all those settings? Theres a text file on the sd card. Copy to your computer, Open with your favorite text editor, change the numbers and save it. Then put the file back on the card. What's cool is you can save many profiles and load them as needed. I formatted it without looking at it. These are not the stock settings but what I've been using. Feel free to change as needed. Not to worry. Just turn it on and record something. It'll write the .txt file to your microSD card. Ive just received a XD (after a 5 week stint getting dusty & generating extra income for the Belgium Mafia/import office) after testing it with the HDMI on a big screen, it maybe worth looking at the smaller sizes. 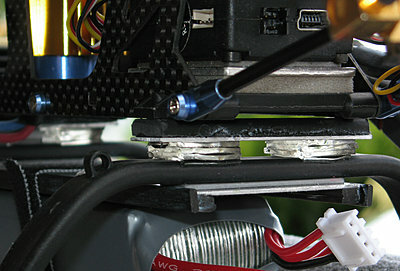 When looking at the full HD 1080p size its zoomed in fair bit, meaning its only using a small part of its sensor. (its a very big image with a fair bit more noise). Switching to the 4:3 image seems to use the whole sensor with a much wider & sharper image. It seemed to be fairly good inside although there is a lot of smoothing & post processing going on. The best live image seemed to be the photo setting or the 4:3 one which would mean you have a little real estate to cut in post. I had time to play with the setting file today. Thanks Dean! I agree 100% with you, both the GoPro's and Replay have their place. It's funny how I keep getting smaller cameras. I moved from an XL2 to a 7D (which I still use) and added a HFG10 which I love, and started using video from the GoPro's more often, now the Replay. I got the Replay up in the air on my T-Rex 450. Here's a before-and-after comparison of the camera being "hard mounted", then with vibration isolation. At first the camera was simply mounted onto the helicopter using the "Heim Lock" mount that was attached to a standoff made of Plexiglass. Afterward, I separated the helicopter into two assemblies: One with the motor and all the moving parts. The other with the main battery, both cameras and the landing skids. The two assemblies were joined with a vibration isolation "block" made of 3M's VHB adhesive. It absorbs vibrations nicely and has significant holding power. A 9 mm square held at least 2 kilograms of sustained tensile load without peeling off. That's way more than the weight of the entire camera/skid/battery assembly at 10 g's. As you can see in the video, there's a lot less vibration. But still more to go. I suspect that mounting the Heim Lock mount sideways has something to do with it. Plus the Plexiglass standoff. So tonight I re-did the setup and hope to do a test flight tomorrow. Iso mount looks good Dean! One question...in your footage, what's all that green stuff on the ground? I heard a rumor that other parts of the world had this thing called "grass"...is that it? Sure looks nicer than desert!! Ha ha! We are back above 100 deg for the next couple of days then I will do another flight test with the mods I did earlier this week! That's a great setup, Robert. I noticed it's also "flybarless"! Those cars sure kick up a heck of a dust storm. I'd hate to be the guy right behind 'em. 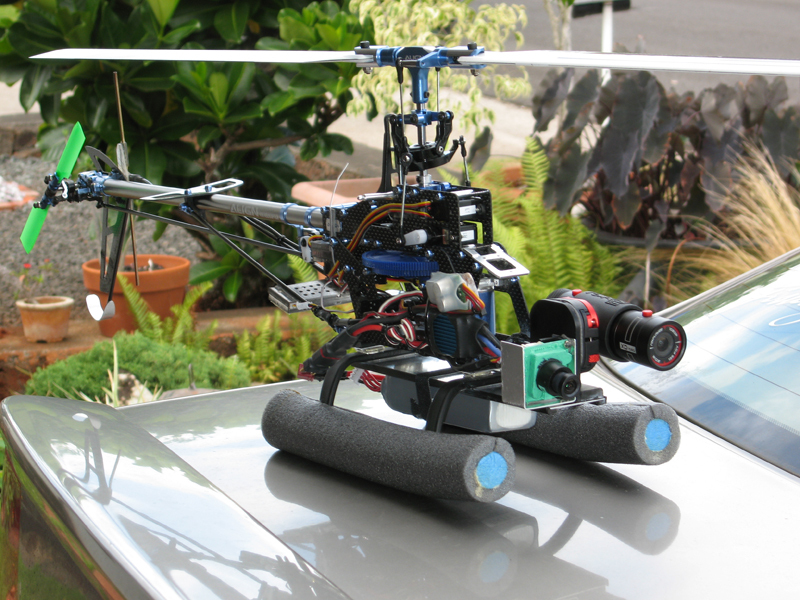 I modified the helicopter and centered the camera in an upright position on the lower frame. I'm hoping it's a more stable orientation for that mount. Here's part of today's test flight. The vibrations seemed to have been reduced. Not bad for a small helicopter. I'm still trying to reduce some of the wagging of the tail. There are several parameters in the flybarless controller that deal with that, and it's not easy figuring out the values for each one. The user manual doesn't have any explanations, and everyone's been depending upon various experts online to help sort it out. Still, it does take time. At 0:51 I unintentionally "buzz" myself! Last edited by Dean Sensui; October 13th, 2011 at 01:33 AM. Switching to the 4:3 image seems to use the whole sensor with a much wider & sharper image. It seemed to be fairly good inside although there is a lot of smoothing & post processing going on. The best live image seemed to be the photo setting or the 4:3 one which would mean you have a little real estate to cut in post. I noticed that the Replay's 1280x960 format seems to be slightly softer than 1280x720. The data rate for both formats are the same, so the deeper frame requires more compression. Haven't done any definitive tests but that's what it looks like. Also, I did some test shots to compare 720p to 1080 and with the 720p format, vertical lines appeared wavy. They were straight in the 1080p format. So more experiments and tests to be done. It could be because when in the smaller resolution your using the whole sensor width & its going to have more of the fisheye effect with the much wider angle. Ive not yet tested it outside. It seems really nice, the image looked good inside, the hdmi out looked good & is obviously not compressed. But there is some filtering going on. Just looked at the gopro here & that also seems to increase the viewing angle at the lower resolutions, but does it reduce the bit rate also? If it does & the replay pumps out the same bitrate then you could really think of the two resolution options as wide angle & normal, you could always increase the size to 1080p & add some blur/sharpening filters in post which is pointless but will please some. Here is some footage that I shot in 1080p30. The quality is much higher than when the Replay is shot at 720p. I don't think I'll be using 720p much after this. The difference is significant. In 720p there is noticeable aliasing in vertical lines. It's not apparent at 1080p.